Mount Royal’s volleyball team had a hot start to the year with a 4-1 record but have dropped their last three matches and sit in the middle of the pack at 4-4. The Cougars were ranked as high as fourth place in Canada at 2-0 to start the year, dropped to fifth place at 3-1 and then dipped down to eighth at 4-2. MRU started the 2017/2018 season with a sweep of Winnipeg at Kenyon Courts in Calgary. The following weekend, MRU split a series with Regina at home and then after, the first road trip on the year saw Mount Royal get swept by Trinity Western. As of Nov. 20, Cougar superstar Alex Donaghy is currently sitting third place in kills-per-set at 3.80 in Canada West, tied for fourth with 114 thus far and is second in aces-per-set with 0.70. MRU travel to Saskatchewan who are at 3-5 to close out November and then host a formidable 6-2 UBC Thunderbirds squad back in Calgary before the holiday break. MRU’s men’s volleyball squad sit at 2-6 early on in the year, holding onto the final playoff spot as of Nov. 20. The Cougars got swept by Winnipeg to start the year, split a series with UBCO and Regina, then got swept by Trinity Western this past weekend. Winnipeg and TRU are two of the top three in Canada West right now. Outside Tyler Schmidt is leading the Cougars with 3.47 kills-per-set and is leading the way with 141 points, averaging 4.1 per set. Mount Royal travels to Saskatchewan for a favourable match-up against the winless Huskies group and then host a 7-1 UBC team in December to close off the 2017 calendar year. MRU’s men’s ball team are currently 4-4 on the season and are on a two game win streak following a weekend sweep of the Manitoba Bisons in Calgary last weekend. Starting the season on the road, the Cougars split a series with Fraser Valley before getting swept by first place Lethbridge Pronghorns. The Cougars responded well with a sweep of their own against the Bisons in two thrilling games. 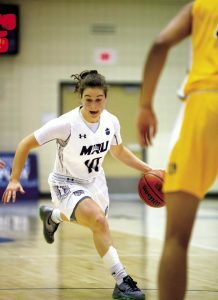 As a team, MRU is shooting seventh in the conference from the field with 43.5 per cent. The long range shooting is up there as well. From distance the Cougars shoot 32.1 per cent, good for ninth in Canada West. The Cougars are also playing great without the ball, pouncing on 44.1 rebounds a game which is second highest in the conference and on the back end, average exactly three blocks a game, good for fourth place. MRU also dish the ball well as a team, sitting fourth in assists per game with 17.8. Senior Josh Ross is the Cougars rock in the back end, averaging a double-double with 19.6 points per game to go along with 10.3 boards. LJ Hegwood is also helping carry team offence, contributing 19.4 of his points of his own a game. MRU hosts Thompson Rivers in Calgary to close out November and then do not see action until an exhibition game against the ‘Horns at the end of December. Mount Royal’s women’s ball team are having a rough start in a heavily stacked conference, still without a win despite having good performances from top players such as Becky Nash. Fifth-year Nash leads the team with 10.4 points-per-game, eight boards and averages 1.8 blocks a contest on the back end. Charity Marlatt is the Cougars other source of offence, shooting a team high 55.1 per cent from the field while averaging 8.1 points a game. The Cougars defence seems to be doing there part statiscally, being second in the league in rebounds-per-game, snatching 44.4 boards per contest and first place in blocks with 3.1. MRU’s team offence is slacking in terms of offensive production, shooting at 33 per cent from the field as a team, ranking them second last in Canada West which correlates to a conference low in points-per-game. Shooting the long bombs also are something the Cougars will need to improve on, shooting 19.3 percent as a team. The Cougars play Thompson River to close the month of November off and then don’t play until the turn of the calendar.